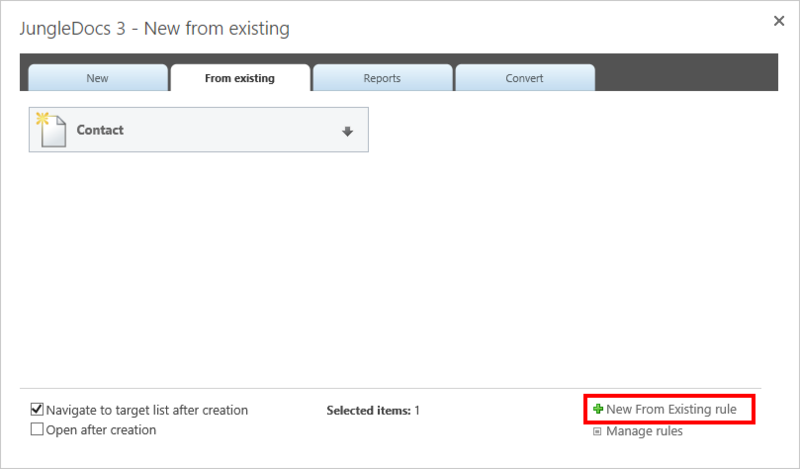 JungleDocs reverse lookup function allows you to easily export items from SharePoint into a specific list given they have a common lookup value. 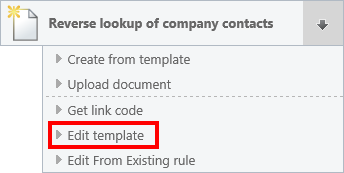 For example, if you have a Contacts list, and the list has a lookup column linking to Company Name column in the Companies list, you can easily generate a report of that company contacts by running JungleDocs from the Companies list. In order to be able to that, you must configure the corresponding JungleDocs template, JungleDocs rule, and content type. In this tutorial, you will learn how to use this function. A mandatory requirement for the reverse lookup to work is a lookup column in your content type that you use to generate the reverse lookup report. in the case of the example above, you need to add the lookup column linking to the Companies list. Select if you want to include any other columns from Companies list and click OK. Once you have the lookup column, you can edit the JungleDocs rule and template. Set miscellaneous settings like rule name and visibility. Now that we have configured the content type and the JungleDocs rule, we only need to configure the template. Now you can select a company, run JungleDocs rule that you previously created, and you will get a list of contacts for that company. Note: if you are trying to resolve items from a list that is on a different site, you can use Site/list in the reverse lookup command. So the command from this example would look like this: Company :ReverseLookup ("Sales/Contacts") if you are running JungleDocs from a site different than Sales.